I rode in my first Pan-Mass Challenge (PMC) in 2008 in memory of my father, who lost his battle with cancer when I was in college. At the age of 12, I first learned that my dad had cancer and might die—something no child should have to experience. He fought for more than 10 years. Losing my dad at a young age impacted my life deeply and I miss him every day. Through watching him fight, I saw firsthand the power of a person’s will to overcome. I learned how invaluable strong family and friends are. I learned to never give up. The PMC embodies all these things. I took a year off in 2009 when my first child was born. My wife, Wendy, and I decided going forward, I would ride every other year because the training and fundraising take a lot of energy and time. In 2011, I planned to take a break. However, in March of that year, we learned our dear friend’s 18-month- old daughter was diagnosed with a stage 4 neuroblastoma. I immediately signed up for the PMC, because it was another way to help. She was treated and went into remission. Each year as I fundraise, I learn about those in my social and professional networks that have been impacted by cancer. Everyone has a story about how this disease has changed their life. It motivates me to continue supporting the fight against cancer. Through PMC, 100 percent of every rider-raised dollar goes directly to the Dana-Farber Institute. It is incredible. My wife, Wendy, and I were at the PMC Heavy Hitter dinner a few years back and heard straight from a doctor at the Dana-Farber Institute about the impact of the unrestricted funds from the PMC and how they recently led to a groundbreaking new drug. A drug that became one of the most important discoveries for treating not just one strain of cancer, but hundreds of strains of cancer. This event is more than a ride. The PMC is an amazing community! I look forward to the big event each year the same way a kid looks forward to Christmas. The event itself is extremely well-organized, but the people really make it an amazing experience. The riders, the volunteers, the supporters bring an incredible energy that makes the PMC electric and addictive. There are literally thousands of people gathered together with a common cause, sharing their stories and experiences with one another. The uplifting power of making a difference for others in need is omnipresent throughout the weekend. My first year the fundraising commitment was $3000. If you had told me then that 11 years later that I would have my eyes set on raising more $12,000, I would’ve told you that you were crazy. But here we are. The PMC has been part of my kids’ lives since before they were born. The event is the lead up to our family vacation every year. I ride my bike to the Cape and they meet me at the Lakeville rest stop. They open our rental house for the week and then meet me at the family finish in P-Town. They see the impact we can have when we set our minds to something. They have now participated in four PMC Kids Rides and they can’t wait to join me on the big PMC once they are old enough. My wife is my partner in the ride. While she’s not the one pedaling, she is the one behind the scenes cheering me on, taking care of the family (especially during the many training hours) and helping with fundraising. The entire experience is truly a family event. 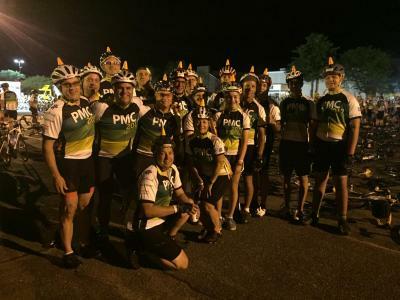 My PMC team is Team Courage-Coneheads! When we started the group in 2008, there were only five of us in a sea of more than 2000 riders that all wear the same jersey. It was hard to find anyone, so one of our team members put a small orange safety cone on his helmet and we used him as our reference point. The next year our team grew and we decided we should all have the cones on our helmets. 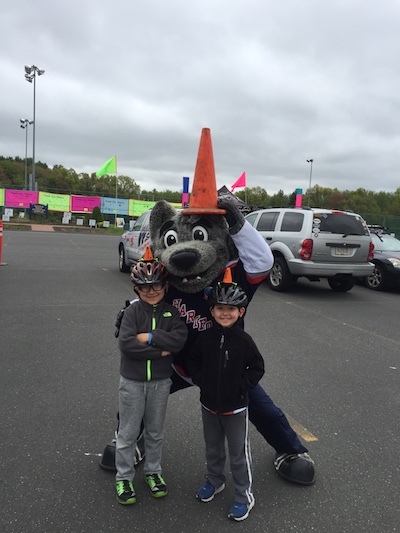 Safety is a big deal for my company, Burns & McDonnell, and many of our team members and corporate sponsors who are within the engineering, architecture, construction and environmental industry — so the safety cones were a very fitting addition to our helmets. 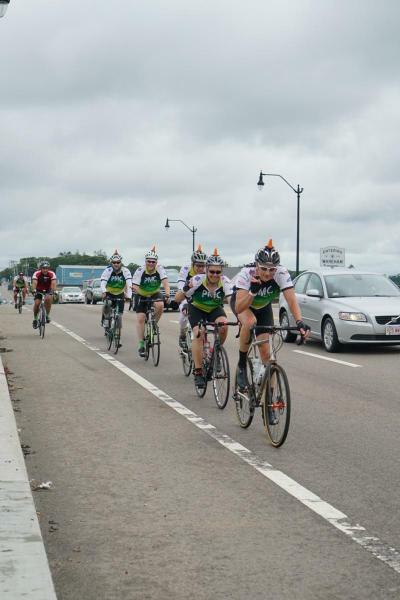 The crowd now cheers for the “Coneheads” each year during the ride. Team Courage Coneheads has grown to more than 30 members and has become a family. We celebrate each other’s milestones and successes. We all look forward to getting together the first weekend in August and spending quality time on the road and after the events at Mass Maritime Academy and Provincetown (P-Town).